Since ancient times, Conveyor belts have helped men to transport, lift and lower heavy loads such as stones, timber, bulk material and others. 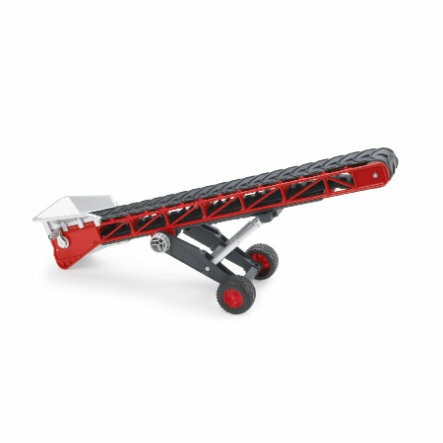 To make it easier for our little master builders and farmers to complete their tasks, BRUDER is now launching a state-of-the-art conveyor belt. This tool distinguishes itself by its attractive design and its lifting and conveying mechanisms that are easy to use thanks to the installed crank. The mechanisms can be used to lift hay bales onto the trailer and transport them to the barn as well as transport and unload sand or rock on/from lorries. The conveyor belt can, of course, also be hooked on to all BRUDER towing vehicles such as tractors, Unimogs, lorries including the Sprinter and construction vehicles equipped with a drawbar coupling.